This is part two. 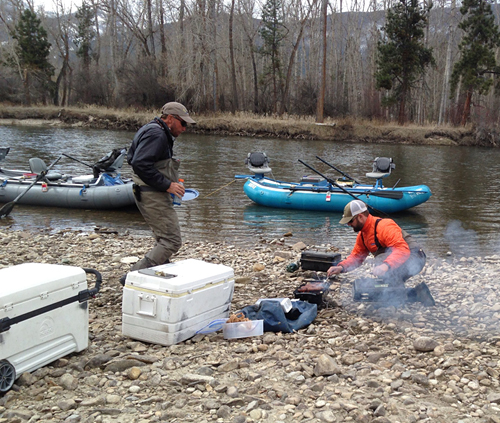 If you missed part one of Joyce’s trip, find it here – Day One on the Road to Montana. After an early breakfast we headed into town to meet the guides. 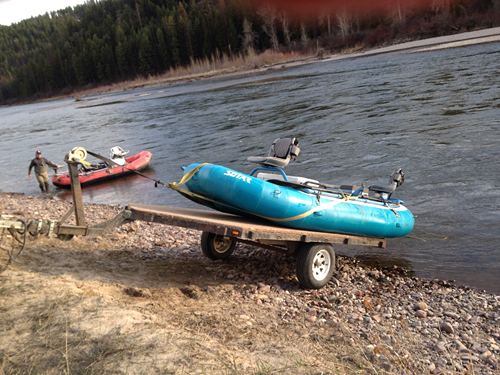 We met the Blackfoot River Outfitters at the fly shop. Our paperwork was completed and away we went. We were assigned guides, 2 guests per boat. The boats were inflatable rafts with a chair in the front and one in the rear for the fishers. The guides sat in the middle. The Bitterroot River was the water chosen for our first adventure. We were ready to get our lines in the water and our flies wet. All four boats put in the water at the same location, but there were times we didn’t see the others on the water. Our guide said we’ll fish last and catch what the others missed. Well, there were plenty of our own missed opportunities. Shore lunch. – Courtesy Joyce Davis. We met up with the other boats for a shore lunch. And what great timing, as we approached the others I hooked another nice rainbow. The shore lunches were great and always included something cooked on a little grill. A typical day on the water ends around 6:30 – 7:00. So we had more water time to go. You are probably wondering about the hatch? Was the hatch as thick as I had been warned? No. But we did see plenty of hatches during the midday hours. 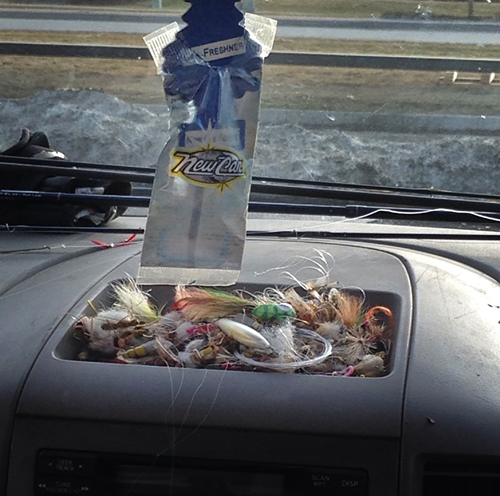 Flies we used included BWOs, Chubby Chernobyls, Stoneflies, San Juan Worms and Streamers. 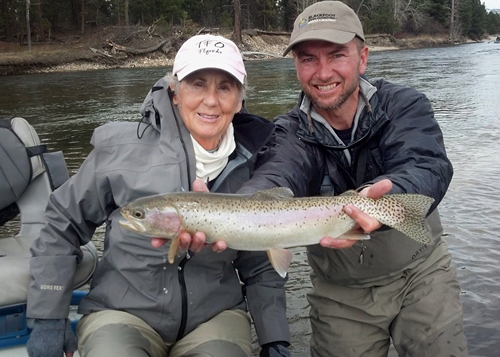 On Day 2 we caught mostly rainbows, cutbow, and browns. My 24-inch cutbow (rainbow-cutthroat hybrid) was the highlight of my day. Back at the lodge there were lots of fish stories to share. We all caught fish and had a great day. Over dinner we heard more of Larry’s fishing stories and about Larry “fishing on the dark side” (any type of fishing that doesn’t involve a fly rod). Fish stories, trivia and movies were bantered about. Day 2 ended with lots of fish in the net.